Okay – so you have this novel burning away in your brain and you want to share it with readers. Great starting point. So, roll up your sleeves, get out the notebook and fire up the computer and get started. It may sound stupid, but it does help to have some idea of what you novel’s about before you start writing – you will change themes, ending etc. along the way, but you need a starting point. You need to write quickly if you are following a particular trend because by the time you’ve finished your novel, that trend may be over. Remember Twilight inspired paranormal novels? Exactly. Another classic rookie error is to work hard on the first three chapters, polishing them and a synopsis to send out to agents and publishers. If they like it, they’ll ask to see the whole manuscript and if it hasn’t been written . . . you’ll end up with egg on your face and they’ll lose interest. A physical writing space is important. Writing at the kitchen table is all very well but if you have to clear away to prepare a meal for your family twice a day you’ll lose focus and purpose. Better to clear a space on your dressing table or buy a cheap table from Ikea which you can pick up and move around to suit yourself. Above all, let your family/partner know that you are serious about your writing and they have to respect that and give you space and time achieve your goals. If you have a spare room, clear it out and give over to writing. You can always tuck your laptop under your arm and head for the nearest café where you can write for an hour undisturbed. If you’re determined, you’ll find a way to finish that novel. When you start out, it helps to be a plotter because you won’t be experienced enough to write a novel from start to finish without some idea of where it’s going. My first novel was written over a number of years and I have kept all the notes. I find that having the bare bones of the story in front of me helps me to plan where the story’s going and to build in highs and lows as I work towards the resolution. Post it notes are particularly useful when planning as you can jot down ideas and move them around on your planning sheet to suit yourself. When you start out on this journey, it’s easy to be over ambitious. It’s tempting to imagine that you can write a multi-layered novel featuring several viewpoints, incorporating flashbacks/ backstory, time-slip – whatever. However, I believe that you’ll have a better chance of finishing your debut novel if you write in a clear, linear fashion which is easier to handle. Keep your magnum opus for when you’ve got a few novels under your belt and have learned your craft. Once you are taken up by a publishing company you will have to edit your novel (with their help), and you might find most of your ground-breaking scenes etc. heading for the shredder. Stephen King’s advice to the rookie author: kill your darlings, even when it breaks your egocentric little scribbler’s heart . . . In other words, you know those favourite words and phrases (and characters) that don’t really support the manuscript but you love because you think they are clever, literary and maybe even the best thing you’ve ever written? Get rid of them. Write them, get them out of your system, kill them and then move on to write a clearer, sharper novel. Don’t overindulge your ego, write a book readers will want to buy/download and then come back for more. How many romance novels have you read where the women sit round the kitchen table drinking endless cups of tea talking about the menopause without the scene moving the plot along? That’s what I mean. When you reach the half way stage in your novel you might need to inject another plot line to carry your themes/plot through to the resolution. I don’t mean write endless pages of description or waffle – re-read what you’ve already written and see if there’s a line you could develop. When I was writing Girl in the Castle the idea of the shinty match came to me and really helped to push the novel forward. It gave me the opportunity for the hero/heroine to see each other in a different context, taught them new things about each other and it was the point at which the heroine fell in love with the hero. Until those pivotal couple of chapters, their relationship had been built on suspicion and distrust. Okay – so you’ve written the novel and now you’re wondering, if it’s any good. At this point, ask a couple of friends (they don’t have to be authors) for honest feedback. One friend, who only reads crime, gives me feedback about structure etc. Another, who reads and reviews for Net Galley, tells me what works/doesn’t work for her. I also have two author friends who read my work and give me feedback over coffee or a glass of wine. We toss ideas around and they’ve said that helping me with my novel has helped them to learn what works/doesn’t work in their writing. The important thing is to listen and think about what beta readers tell you, and then go on to write a better, stronger novel. When I started sending manuscripts out to agents I thought that all that was required was a well written novel which they would (kindly) take round publishers for me. It isn’t quite like that. Publishers want novels they know they can sell, especially to supermarkets – the new bookshops. A quick glance at the shelves will show you what’s trending at any time: Cornish Tea Shop/Cake/Wedding Shop tropes World War II sagas, Crime, Healthy Eating etc. If your novel doesn’t fit into those categories an agent won’t be able to sell it to the publishers, no matter how much they ‘love it’, Publishers won’t be able to sell it to the supermarket buyers who have so much clout these days. Unless they believe in your novel and are willing to spent some of their marketing budget on promoting it, you won’t get very far. I write Scottish-themed romance and when I meet with agents/editors they say the love my books, but they can’t see them sitting on the supermarket shelf. I could write in a different genre, but I don’t want to – so I’ve self-published and am doing very well on Amazon, thank you. Before sending your novel off to agents or publishing on Amazon, make sure that the manuscript is the best you can make it. This will mean employing an editor, proofreader, formatter etc. – and they all come at a price. Or, you can do it all yourself, there are plenty of self-help guides out there. I have employed proof readers/editors in the past, with very mixed results. It’s definitely a case of buyer beware so do ask around and find out what’s worked for other writers. If the odd typo slips through and appears in your finished novel, don’t despair – it happens to the best of writers. I know how to format my manuscript for uploading onto Amazon and CreateSpace but I prefer for someone else to undertake that work for me. I’m just about to self-publish book five and I know what works but it’s been a steep learning curve. In an ideal world, all we want to do is write. But nowadays that isn’t enough. You need to get word of your books ‘out there’, and find readers. Unless your publishers are willing to spend money on you, you’ll have to do most of the promoting yourself. And, for that, you’ll need a solid on-line presence. A good time to kick this off is while you’re planning/writing your first novel. I takes a long time to establish mutual friendships/support groups, build up a following and get to know bloggers and other authors. In order of importance I’d say: Facebook, Twitter, Instagram work best. Also, build a simple website which includes a blog – it doesn’t have to be all dancing, all singing. I find WordPress works well. Buy yourself a decent mobile phone (I find the iPhone is ideal) as you’ll need to build up a stock of photos to use in posts etc. Be generous towards other social media users: retweet them, share their posts and leave comments. 8/10 others tweeps will do the same for you. I could write at great length about his subject, but that will be for another blog post. After teaching her 1000th pupil and working as a deputy head teacher in a large primary school, Lizzie decided to pursue her first love: writing. She joined the Romantic Novelists’ Association’s New Writers’ Scheme, wrote Tall, Dark and Kilted (2012), quickly followed by Boot Camp Bride. Although much of her time is taken up publicising her novels she published Scotch on the Rocks, which achieved Best Seller status within two weeks of appearing on Amazon. 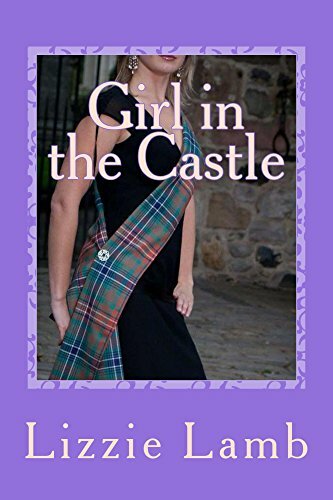 Her next novel, Girl in the Castle, reached #3 in the Amazon charts. Lizzie is a founder member of indie publishing group – New Romantics Press – and has co-hosted author events at Aspinall, St Pancras and Waterstones, Kensington, talking about writing and the research which underpins her novels. Lizzie hopes to publish her next romance Sweet Little Lies in Summer 2018, and has more Scottish-themed romances planned. As for the years she spent as a teacher, they haven’t quite gone to waste as she is building up a reputation as a go-to speaker on indie publishing, and how to plan, write, and publish a debut novel. Lizzie lives in Leicestershire (UK) with her husband and a naughty parrot called Jasper. That’s some great advice you’re giving, Lizzie! I am sure it’ll help many wannabe writers out there. Thanks for the good advice on writing. I reckon I shall stick to reading and enjoying other people’s hard work. Thanks Lizzie for bringing so much pleasure. Best wishes too to the rest of the girls in the group. Brilliant tips from a great author. Thank you for your generous words of wisdom. Some really good advice here for budding writers from a superb author. Rock solid advice here Lizzie, simply and sagely put! Excellent pointers for someone starting out and yes I totally agree, writing a novel is hard work but so worth it!